Data is electronic information that is sent to or from your phone. Data is used when you share photos, send emails, watch videos or listen to music online. The amount of data used is measured in MegaBytes (MB) and Gigabytes (GB). Each activity uses a different amount of data. Let's assume you take a plan which offers you 1 GB of Data. What does that actually equate to? With 1 GB of data to spend solely on WhatsApp or Facebook, you could send over 1.5 million messages. However by sending / receiving images or videos your data will be consumed much faster. Also, WhatsApp will automatically download all media messages by default setting whether it is in Wi-Fi or Cellular data. This auto-download feature uses a lot more data. WhatsApp & Facebook also allows video and voice calls which consumes more data for both the person calling and the person receiving. The size of a single webpage varies; some websites have videos that auto play, whiles others may have images, or just text. If you view plain webpages that contain mainly text, you can view more with your data. If you access webpages that are full of high resolution images, these use up more of your data, so you’ll be able to view a little less. Also, applications such as Facebook and Instagram now allow for live streaming which consumes more data. Whether you love Instagram, Facebook, Twitter or have your own blog, you’ll be able to upload over 130 photos a day for an entire month with 1GB of data. Larger photos will use a bit more data, but for general social media, you’ll have enough data to share whatever you want. When it comes to emails, you’ll be able to send hundreds with 1 GB of data. This includes work emails, messages to friends and more. Emails with images or large attachments use more data. Forwarding long emails will also use up more data. 1 GB of data gives you watching time on YouTube. This means you can view videos back to back with ease. If you watch all your videos in very high quality you’ll use more data, so be careful when steaming lots of YouTube videos. The higher the quality, the more data you’ll spend. Don’t need the music video? Just download the songs instead. Music downloaded uses the same amount as streaming, so you can stream the songs you prefer. 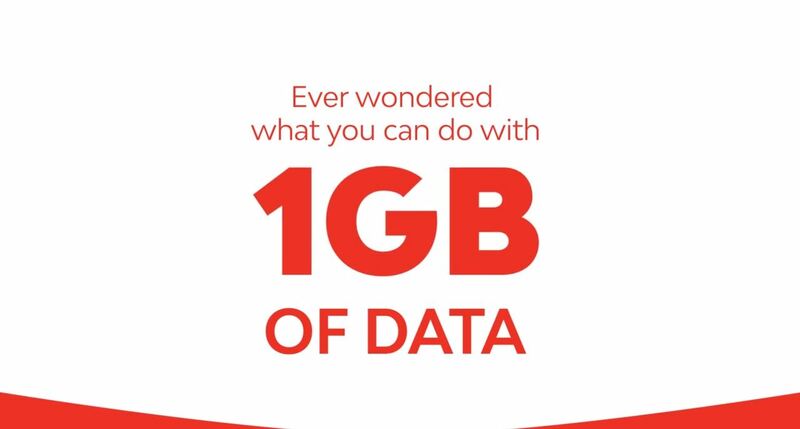 Take a look at the following video to see what you get with 1 GB of data.